Hello all! So glad to see you today. I hope everyone is staying warm and cozy on these cold days. With this cold weather comes the desire to get a start on my Christmas cards. I just got this stamp set of adorable penguins, and a very Victorian style girl holding a sign. 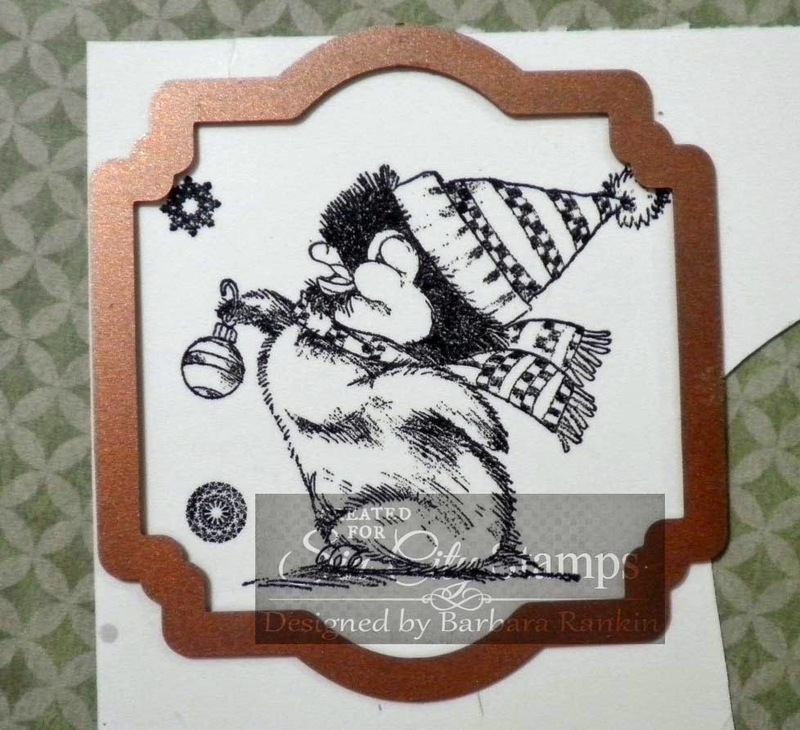 I could hardly wait to put stamps to paper and get started coloring and embellishing. My first card uses this adorable penguin from the Penguins on Ice stamp set. 1. Cut olive card stock to 8-1/2" x 5-1/2", fold in half to make 4-1/4" x 5-1/2 side folded card. 2. Trim red print paper to 4" x 5-1/4", adhere to card front. 3. Use Labels 22 die to cut gold card stock layer. Stamp penguin onto white card stock with Memento black ink and use smaller size Labels 22 die to cut out. 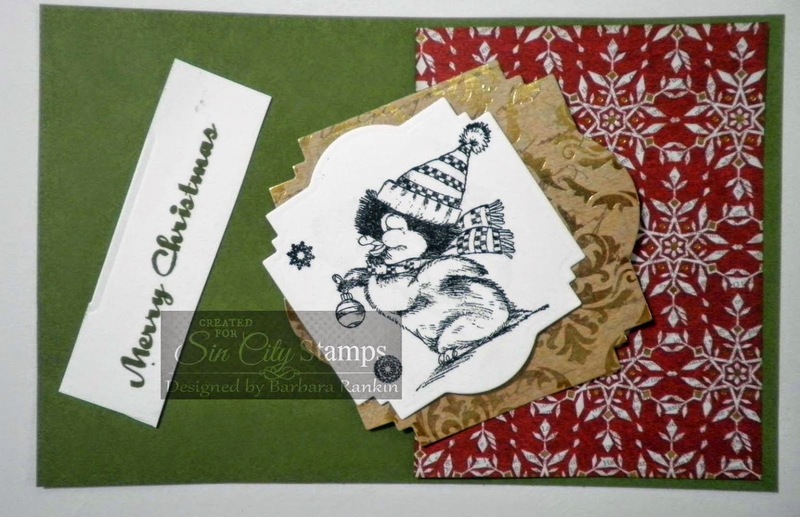 Stamp Merry Christmas onto a scrap of white card stock with Olive Green Pastel chalk ink. I find it is always best to stamp my image first, then determine which dies I have will work best. 4. Color image with Copic markers, edge with Vintage Photo distress ink to give it an aged look. Use pop dots to adhere this piece to the larger gold print die cut layer, then to the card front, as shown. 5. 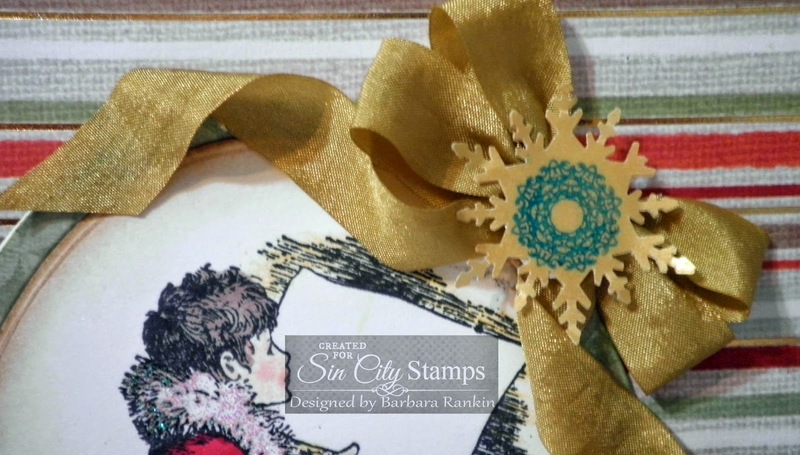 Trim stamped sentiment with a straight ruler, then use decorative edge scissors to trim both sides. Edge with Vintage Photo distress ink and adhere to card front below focal image. 6. Punch 8-9 holly leaves from the green print paper. Edge with Peeled Paint distress ink and glue beneath pop dotted focal image in upper right and lower left corners. 7. Add Crystal glitter glue to hat and snowflakes. 1. Cut Cherry Red card stock to 6"x12", fold in half to make a 6" square top folded card. 2. Trim print striped paper to 5-3/4" square. 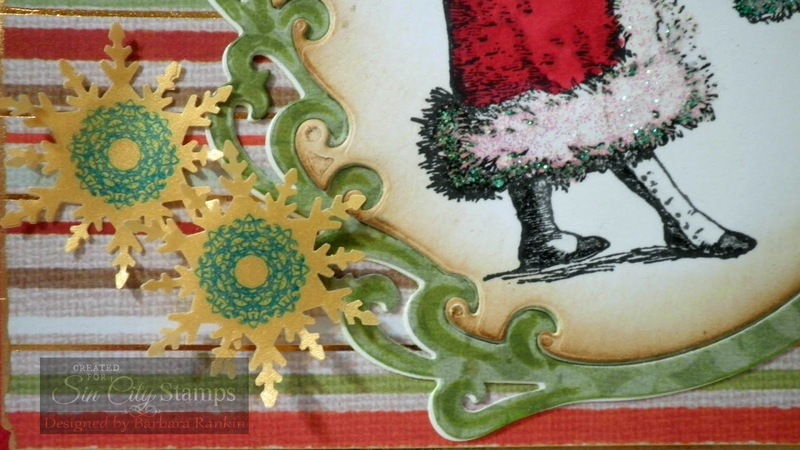 Use decorative corner punch on all four sides and edge with Krylon gold leaf pen. 3. 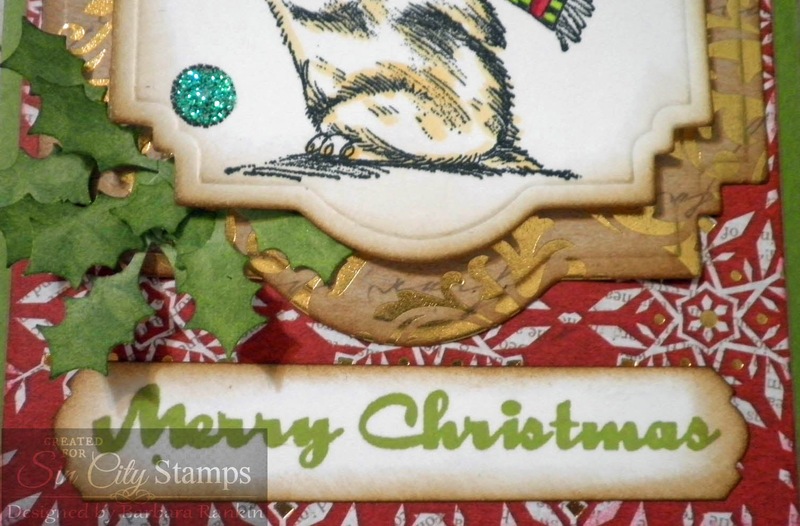 Stamp holly in upper left and lower right corners, first with Olive Green Pastel chalk ink. 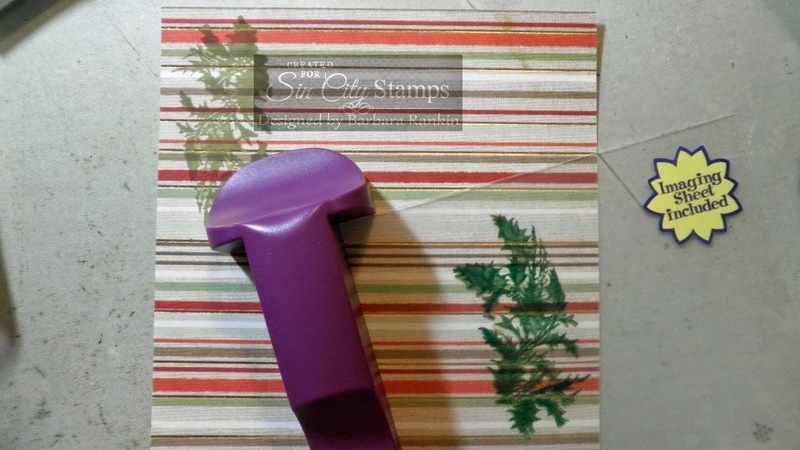 Using a stamp positioner, stamp the holly again using the Memento Cottage Ivy ink. This brings back the fine detail lines over the chalk ink, while the chalk ink acts as a colored-in background. In the photo above, the upper left image is stamped with the chalk ink only. 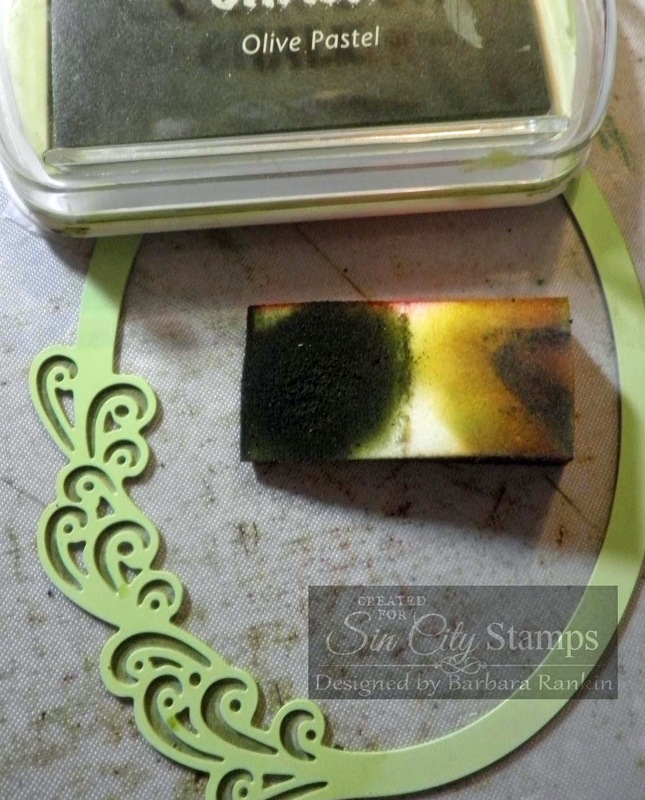 The image below shows the detail after stamping over the chalk ink. 4. Adhere this layer to the card front. 5. 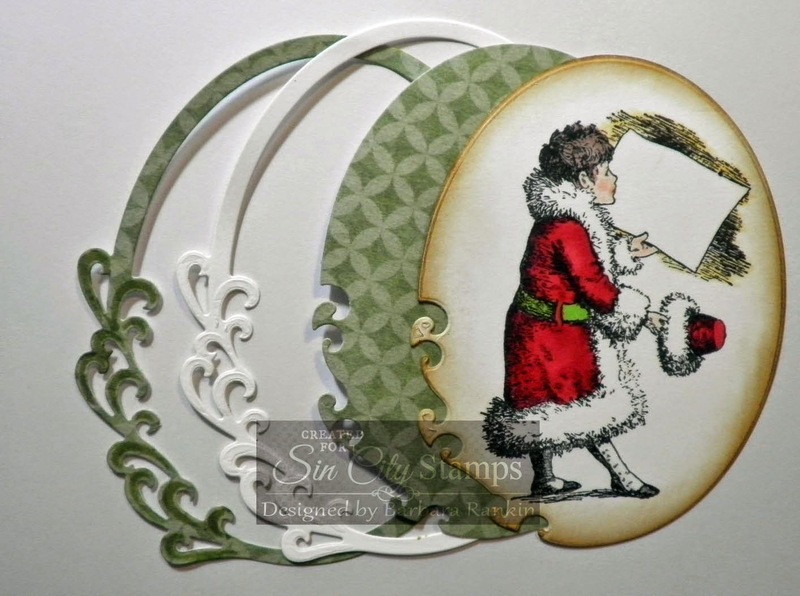 Using the larges oval frame die, cut out the green print and the white card stocks. Stamp and color the girl holding blank sign image on the white oval and edge with Vintage Photo distress ink. 6. Sponge Olive Pastel chalk ink through the die on the green print paper. I removed the center before adding the ink, so the paper frame is underneath the green metal die in the photo below. 7. I adhered all pieces together, and offset the green print framed piece over the white framed piece before attaching to the front. 8. 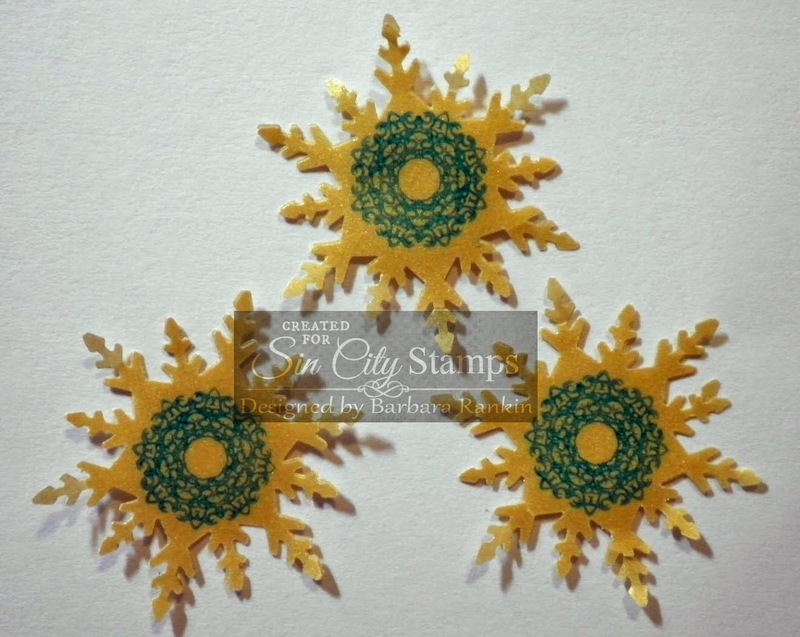 Punch three snowflakes from gold vellum and stamp one of the small snowflakes in the center with Emerald Green StazOn ink. 9. Make a double bow with the gold rayon seam binding and adhere around the top of the frame, adding one of the snowflakes to the center of the bow. 10. Adhere the two remaining snowflakes to the lower left side of the frame, pop dotting only one snowflake for dimension. 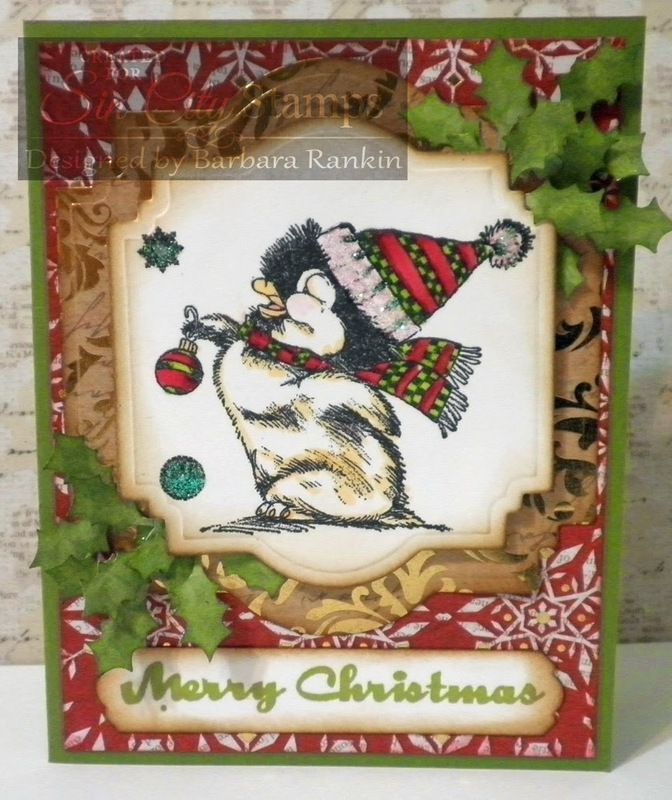 Whether you are making 1, 10, or 100 Christmas cards this year, both of these cards can be made very quickly. 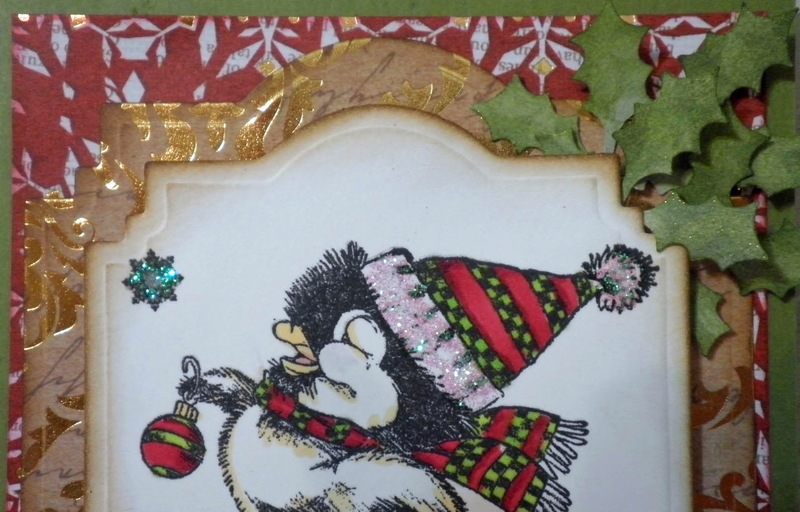 I hope you enjoyed my project today and that I have inspired you to get busy on your card making for the holidays. 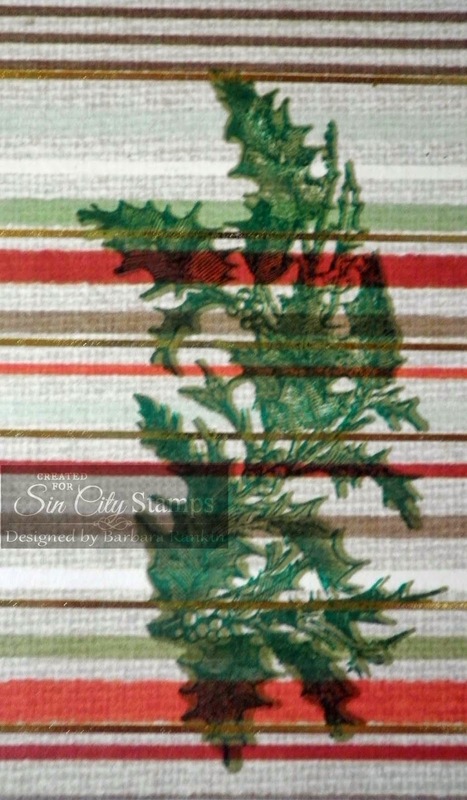 So be sure to stop by the Sin City Stamps online store for all your seasonal stamps, and check out the fabulous inspiration from the rest of the team on the SCS Blog. Thanks for stopping by, and have a wonderful and creative weekend! Very cute love them both!